Having trouble getting your kids (or the big kid) to eat more fish? Cook this to make the fish dish more fun. A way to disguise the fish meat in a fun-looking drumstick-like appearance, the kids will be more than willing to pick up one to try. Yes, it works! This sugar cane fish meat drumstick tasted very delicate with an aroma of egg coated on the surface of the fish drumstick. I liked the tenderness in the fish meat, too. This will surely be an impressive snacks to be served to your guests during a casual tea party at home, too! 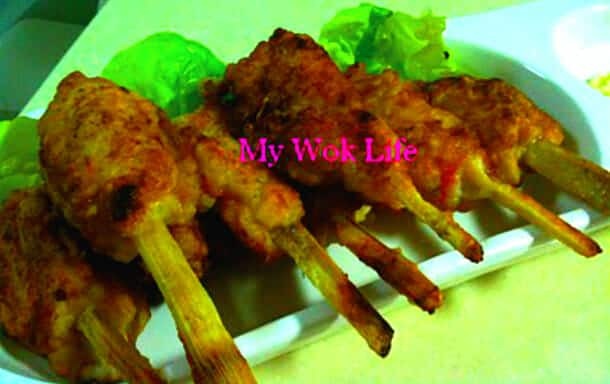 Special sugar cane sauce: Mix 1 teaspoon of oyster sauce with 3 tablespoons of sugar cane. 1) Rinse the peeled sugar cane. Chop peeled sugar cane into 2 sections, crosswise, and then, split each section into quarters, lengthwise, to create 8 smaller sticks. Set aside. 2) Season fish paste with the listed seasonings, stir to mix the ingredients well. Add corn kennels. Divide fish paste into 8 portions. 3) Grease your fingers with oil. Pick up a portion of the fish paste and press it on the sugar cane stick, from top till halfway down the sugar cane stick to create a drumstick-like fish cake stick. Leave the lower portion of the sugar cane stick exposed to serve as handle. Remember to press the fish paste firmly on the sugar cane to ensure adherence. Repeat step till all remaining 7 portions are completed. 4) Heat wok with oil over medium-high fire. Roll the sugar cane stick to coat the fish cake on-stick with egg solution, followed by corn starch. Repeat step for all sugar cane fish cake sticks. Then, place in the heated wok to fry till golden browned. Drain and arrange on serving dish with choice of dipping sauce. Serve. For more options: Mix minced fish meat with minced shrimp meat or mince pork for more comprehensive biting pleasure and taste, if desired. 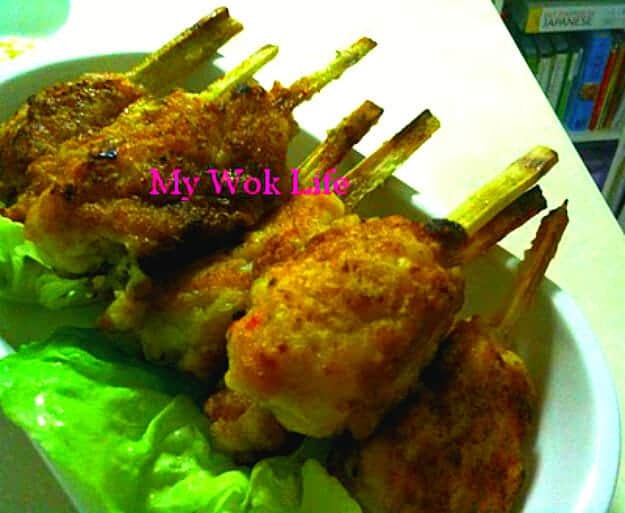 A stick of fried sugar cane fish cake counts about 160kcal. Tips: Use store-bought ready fish paste, for convenience. However, expect much softer and moist texture in the fish paste. * Use packet sugar cane, if you have difficult to get fresh sugar cane juice. * Use shallow-frying method (to save oil usage) over deep frying as fish meat is cooked faster and easier.